vCloud® Air™ is a public cloud platform built on the trusted foundation of vSphere, compatible with your on-premises data center, that includes infrastructure, disaster recovery, and various applications as service offerings. vCloud Air allows you to extend your workloads into the cloud with ease. You can migrate existing onsite virtual machines (VMs) to the public cloud or start up new application VMs directly in the cloud. You can also easily port VMs and other business-critical workloads back and forth to the location of your choice, all with the secure and capable foundation of vSphere. In a hybrid cloud, onsite and offsite IT environments are not just connected and integrated with common management, they're also designed to run existing and new applications in exactly the same way. VMware vCloud® Air™ is the only enterprise hybrid cloud for VMware customers, giving you unlimited IT for business innovation while regaining IT control. Built on VMware vSphere®, vCloud Air quickly and seamlessly extends your data center into the cloud using the tools and processes you use today. Join us for this webinar and discover how your organization can combine the convenience and agility of on-demand public cloud with the freedom to move workloads on and off premises as you need. This webinar will include a demonstration of the service. Learn how a hybrid cloud built on vSphere can give you more flexibility. Register now. Who Should Attend: Infrastructure, Cloud, Security and Network Architects, Managers and Directors. No business likes leaving its operations vulnerable to downtime or loss of data. But the complexity and expense of traditional disaster recovery solutions force many businesses to make tradeoffs, and operate with only a limited disaster recovery plan in place—or none at all. Learn how this recovery-as-a-service solution is helping businesses protect their environment by using the cloud for simplified failover and recovery operations. The agility and cost-effectiveness of moving applications to hybrid cloud is an increasingly appealing option to businesses who need to respond quickly to customer and market demands. Join us at this webcast to hear Tom Bittman, Vice President and Distinguished Analyst from Gartner Research, discuss the current state of hybrid cloud adoption, reasons why organizations are moving to hybrid cloud, and the key benefits they are achieving. In addition, Creative Solutions in Healthcare CIO Shawn Wiora will share his organization’s criteria and business case for moving applications to hybrid cloud. Cloud-based disaster recovery is a flexible, cost-effective way to protect your business critical applications and data in the event of a disaster or disruptive event. Join us for this technical webcast and get a deep dive on VMware vCloud® Air™ (previously known as VMware vCloud® Hybrid Service™) - Disaster Recovery, a new recovery-as-a-service offering for VMware vSphere® virtual environments. You’ll get an in depth look at how to get Disaster Recovery set up and running. This webcast will include a demonstration overview of the service. VMware vCloud® Air™ is built on the same VMware vSphere® platform that powers millions of applications in data centers today. As a result, you can leverage your existing skills and embrace hybrid cloud as a simple extension of your own data center--all while getting the geography, scale, and on-demand resources of a public cloud service. Join us for this technical webcast with Demo and see how easy it is to connect to the service and manage your hybrid cloud with your vSphere Web Client. Hybrid cloud is emerging as a way for healthcare organizations to transform legacy healthcare systems into robust, agile environments. VMware vCloud Air™ is a secure, infrastructure-as-a-service hybrid cloud, built on the trusted VMware vSphere® foundation. Join us for this webinar and discover how you can take advantage of the agility and flexibility of hybrid cloud for the unique needs and compliance requirements of your healthcare information. Would you benefit from immediate access to scalable, production-ready environments to accelerate the development and testing of your applications? Can you benefit from seamlessly extending your application services to a fully compatible hybrid cloud service - without requiring any architectural or configuration changes? 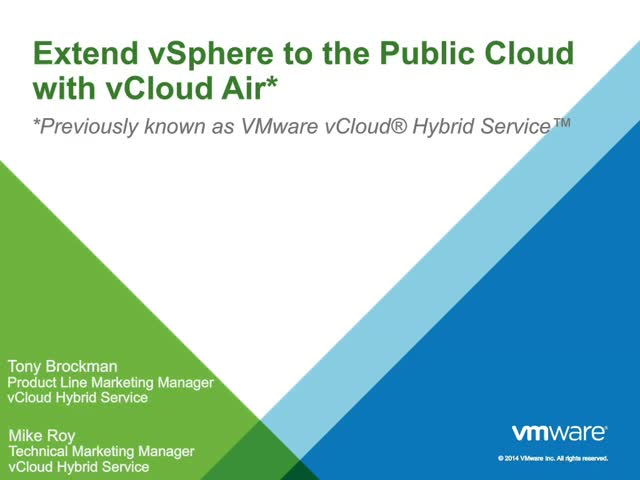 VMware vCloud® Air™ (previously known as VMware vCloud® Hybrid Service™), a secure, infrastructure-as-a-service hybrid cloud - supports a variety of use cases like these, enabling you to leverage your existing VMware vSphere® platform skills, processes, and tools that you know and trust. In this webcast, you will learn how to get started with hybrid cloud with two common use cases for development and testing and packaged applications. This webinar is for IT and Application Architects involved with provisioning and managing IT infrastructure. The data centers for VMware vCloud Air provide a robust physical infrastructure that leverages advanced technologies to maximize performance and uptime. Watch this short video that highlights the core technologies that power vCloud Air, including virtualized networking, fully automated high availability, auto-tiering storage, and more. Watch this short video and learn the benefits of using vCloud Air for any of these top 5 use cases: development and testing, extending existing applications, disaster recovery, modernizing enterprise applications, and creating next-generation and mobile applications. Watch this 2-minute animated video for an introduction to vCloud Air Disaster Recovery and learn about the highlights and key benefits of the service.